I hope you all had a fab long weekend! We took a small road trip to St. Louis, which was fun b/c I had never been. Its a much bigger city than I expected with lots to do. We did a few touristy things, some shopping and ate at some great restaurants! Although the main highlight was that Nelly was staying in our hotel! We ran into him twice which was pretty cool! So now its back to reality! While Labor Day is obviously to recognize the American worker it has also come to be the unofficial end to summer...which is so weird b/c we still have 3 weeks left (and what feels like a few more months if you live in the south). So then there is the obvious white after labor day rule. I will admit I use to stick to this completely, yet I now could care less and think white in the fall and winter can be completely chic. Here are some ways still give your white a home in your closet! or a long fur vest! Finally...and all white ensemble. 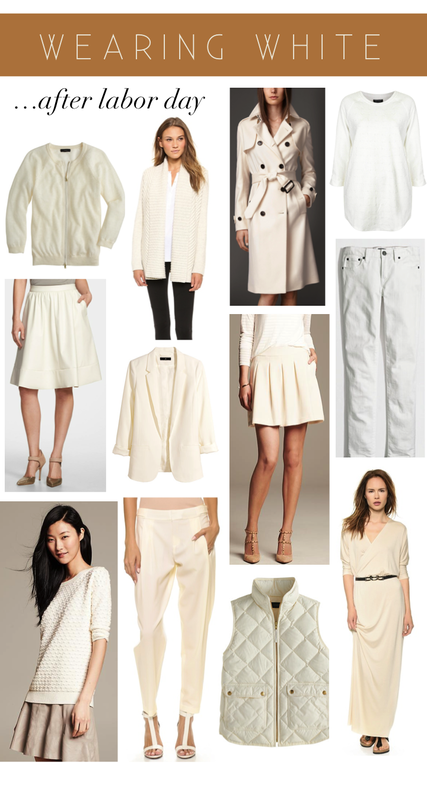 Just pay attention to the shades of white and fabrics used to make the look more for fall/winter vs summer/spring.